Abstract : Continuing with the test of the MEMCEI v2.1 code, the recalculation of the forces and momentum on the TF coils in HT-7U tokamak is carried out. 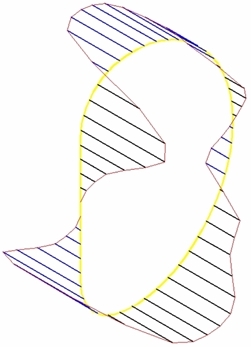 The profile of the forces along the length of the coil is obtained and so the overturning momentum. It is compared with one report from the HT-7U team. In the OLD design the PF9 and PF7 was defined as an single vertical bigger PF7 coil. In this calculation the PF7 coil has n7= 11 * 4 turns , n9 = 14 * 20 - n7 turns (PF7 of the OLD design had 14 * 20 turns), n11= 7 * 10 turns. The other coils have the same number of turns in both designs. Additionally there are slight differences in the position of the coils between the two designs that are considered irrelevant here. This information is detailed on Table2, Fig2 and Fig3 in . All those transformations are done to try not to redesign the NEW geometrical model of the HT-7U to produce the OLD design of HT-7U. Two calculations are done, calculation A and B. The A uses only one loop per TF coil while the B uses 5 loops and 230 elements per TF coil. See  to know the different types of models of TF coils. This can be useful to know if the less accurate result converge to a better result. The currents are taken from Table 6 of  . These currents correspond to a final stage in a normal pulse. 106 A is used for plasma current. TF coils are loaded with 12200A , using 196 turns. These are the conditions for Bt=4.5T in the OLD design. 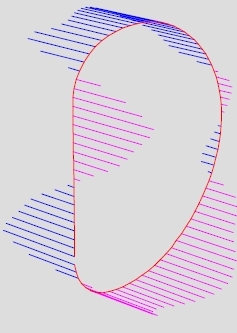 The resulting magnetic field in the plane x=0 . appears on the Graph 1. Here the use of PF7+PF9 as a single PF7-OLD coil was not implemented yet. 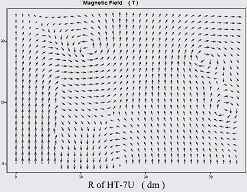 From this magnetic field the forces and momentum are calculated. The forces from calculation A are shown on Graph 2. 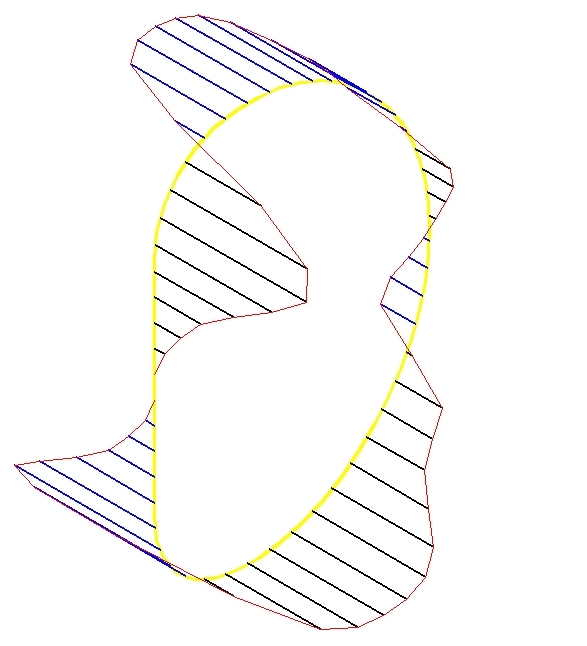 The maximum force is 2.386 x 106 N . Presently individual forces acting on particular segments of the coil cannot be calculated using MEMCEI v2.1 code for the case B. The general structure of the loads is very similar to the original figure from Table 6, figure 7 of , copied in Graph 3. Since small variations on the current of the PF coils produce notable modifications in the structure of the resulting forces, the correctness of the code is positively supported. The respective moment on the TF coil at axis Y- (this is the TF coil number 1), in calculation A, is My= 2.019 x 106 N m = 205.8 ton m. From  the result is 398 ton m . The reason for the enormous discrepancy is not clear till now. One value is approximately twice the other but this does not help. 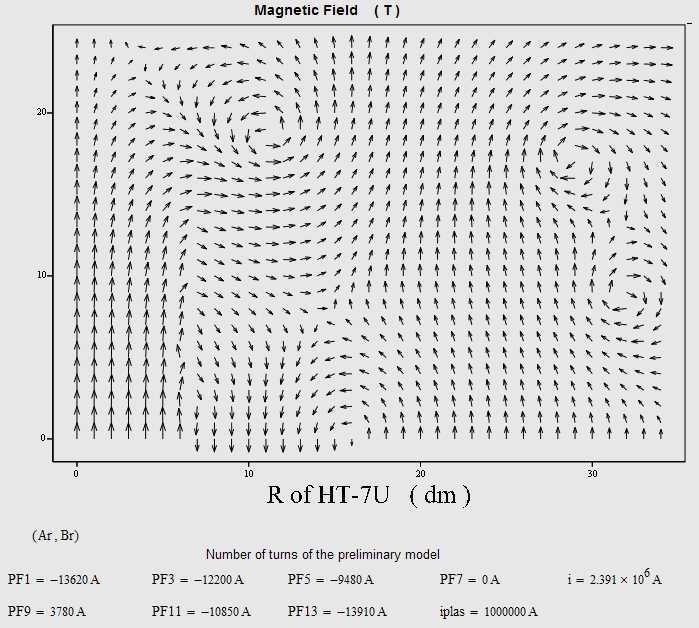 Further information about the magnetic field calculated in HT-7U is necessary to know at what point the calculation is mistaken. Additionally Mx= 8318 N m Mz= 52 N m . They should be zero in an ideal tokamak but are small enough. In calculation B My= 2.027 x 106 N m so in this case the influence of the number of elements of the TF model have little impact. It is necessary to discover the reason of the discrepancy. Graph 1 . Magnetic field in the plane x=0 . Quadrant X+ Y+ .